KE00002 is a solid phase sandwich Enzyme Linked-Immuno-Sorbent Assay (Sandwich ELISA). 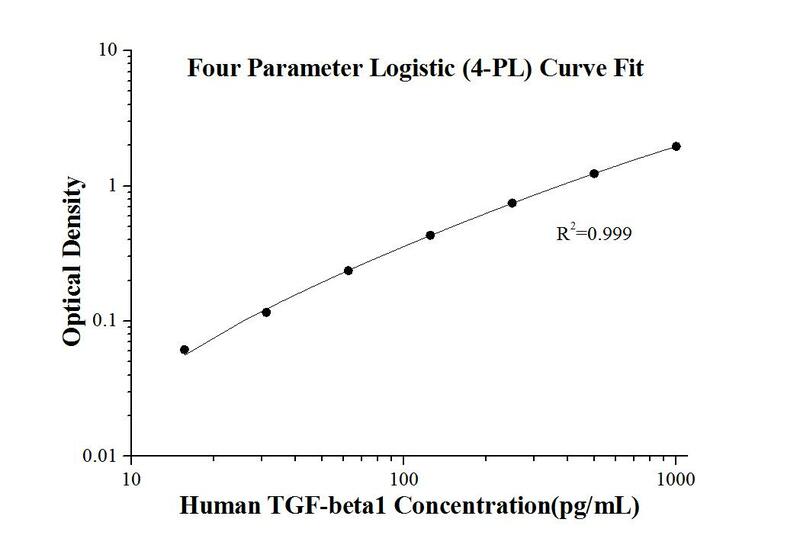 The TGF-beta1 ELISA kit is to be used to detect and quantify protein levels of endogenous TGF-beta1. The assay recognizes human TGF-beta1. A monoclonal antibody specific for TGF-beta1 has been pre-coated onto the microwells. The TGF-beta1 protein in samples is captured by the coated antibody after incubation. Following extensive washing, a polyclonal antibody of biotinylated specific for TGF-beta1 is added to detect the captured TGF-beta1 protein. For signal development, Streptavidin-HRP is added, followed by Tetramethyl-benzidine (TMB) reagent. Solution containing sulfuric acid is used to stop color development and the color intensity which is proportional to the quantity of bound protein is measurable at 450nm with the correction wavelength set at 630 nm. TGF-β is a member of the transforming growth factor beta (TGFB) family of cytokines, which are multifunctional peptides that regulate proliferation, differentiation, adhesion, migration, and other functions in many cell types. TGF-β is produced by a number of cell types including regulatory T cells, fibroblasts, epithelial cells, and endothelial cells. TGF-β acts synergistically with TGFA in inducing transformation. It also acts as a negative autocrine growth factor. TGF-β plays an important role in bone remodeling as it is a potent stimulator of osteoblastic bone formation, causing chemotaxis, proliferation and differentiation in committed osteoblasts. TGF-β appears to promote late stage progression and metastasis in some cancers. MicroRNA-23b Targets Ras GTPase-Activating Protein SH3 Domain-Binding Protein 2 to Alleviate Fibrosis and Albuminuria in Diabetic Nephropathy. Metformin reverses prostate cancer resistance to enzalutamide by targeting TGF-β1/STAT3 axis-regulated EMT. PARP12 (ARTD12) suppresses hepatocellular carcinoma metastasis through interacting with FHL2 and regulating its stability.